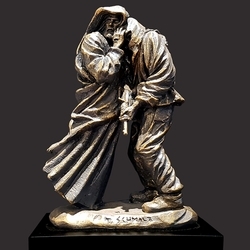 Love Your Enemies Christian Sculpture by Timothy P. Schmalz is a finely detailed reminder of one of Christ's most difficult commands to follow; loving those who are our enemies. This beautiful conversation piece would make a wonderful addition to any church or home decor setting. This miniature sculpture is a very challenging image that portrays the quintessential example one of the toughest gospel messages to follow. This 11"x7"x5" solid resin-stone cast is coated in a realistic bronze finish and is mounted on a solid matt black base. Mr. Schmalz personally sculpts every original small masterpiece complete with his signature or monogram. Each replica is detailed by hand to the exacting standards of this modern day master sculptor.